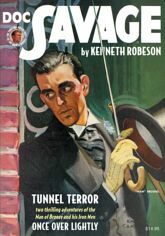 The pulps' legendary Man of Bronze returns in action-packed thrillers by William G. Bogart and Lester Dent writing as "Kenneth Robeson." First, a deadly fog envelopes men and transforms them into mummified corpses, threatening the construction of an important engineering project. Then, in "Once Over Lightly," the owner of a California resort is murdered, but the victim's own will could provide the clue to the mystery, in a rare adventure narrated in the first person! This deluxe pulp reprint showcases the classic color pulp covers by Emery Clarke and Walter Swenson, and also features the original interior illustrations by Paul Orban and historical commentary by Will Murray, author of fifteen Doc Savage novels.